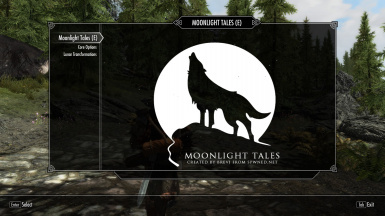 Moonlight Tales Special Edition is released! Please support the project if you like it: endorsing and voting is much appreciated. Absolutely no other werewolf mods! Disable the appearance system in Moonlight Tales Special Edition. 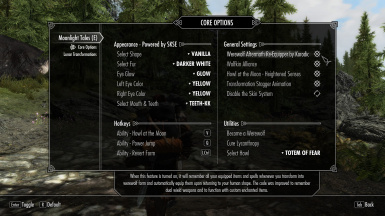 Use the SKSE skin system in Moonlight Tales Essentials (more options). 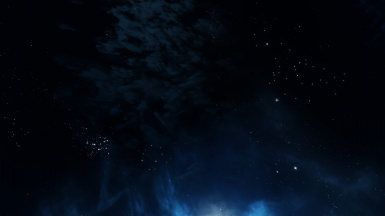 Unbind the keys for Howl at the Moon and Revert Form. Do not use these! You CAN use Power Jump if you want to. You CAN also use Aftermath Re-Equipper. I know this is a bit late (since the last update was over three years ago) but i had a question about a possible patch/update.. I'm not sure if you'll ever get a reply from the author. But in the meanwhile, you could disable Wolfkin Alliance and use One with Nature instead. It gives you full control in that regard. 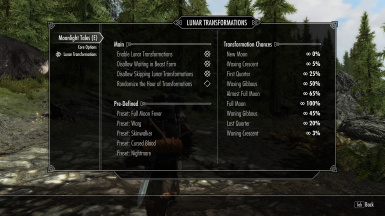 I've run into an issue where despite having the mod installed correctly and running FNIS as per the instructions...none of the animations play. There's no T pose, so I know that the FNIS installation is fine, my character just stands there. Any suggestions? Do you mean you can't move at all? 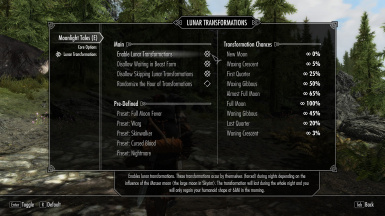 Or can you move but not use the long howl or the power jump? If it's the latter one; is it your very first transformation during the quest? Because you can't use any of those special abilities during that; they are disabled. You can use them as soon as you transform the next time. I've always had duplicate MCM menus of Moonlight Tales (not essentials). Could the cause be that both mods have "MoonlightTalesSkyUISplash"? Should I delete one? this mod is amazing. it adds much needed content to werewolf gameplay. nicely done. (plz not this mod is not the cause of my current glitch. and it seems to be a problem even in vanilla Skyrim from what i can see) -iv even had this happen on skyrim SE on the ps4 as well-... so hopefully someone else has experienced this and maybe have a fix for it. 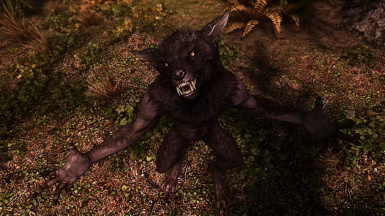 i seem to be having a unusual bug that occurs every time i become knocked down while in werewolf form. 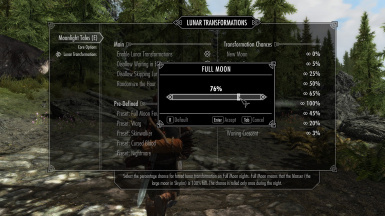 it seems my PC werewolf becomes stuck in place and does not seem to completely stand up. also the 3rd person view becomes stuck in one direction. 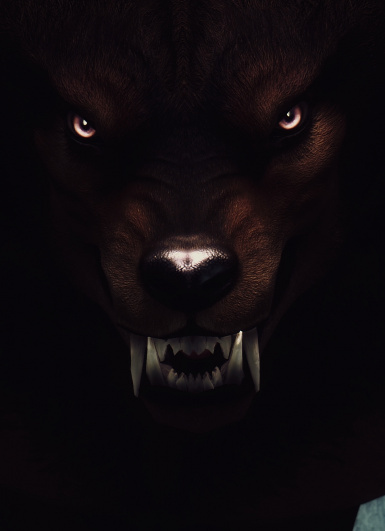 only happens when being knocked down as werewolf. I have also seen this happen to NPC werewolves as well and they also becomes stuck in place. my only guess is the skeleton somehow has a issue during this state. iv been unable to figure out what could be causing it. i hope that someone might perhaps have encounter the same issue and could potentially have a proper fix. if anyone has an idea as to what could be causing such glitch... and maybe have a fix for the problem plz let me know. iv been using a command (Player.placeatme 467bb) to summon a twohanded wielding NPC -stormcloak- and i usually summon about 5 of them and let them smack me untill the glitch occurs. to be fair though this glitch seems to happen almost all the time as soon as i am knocked down. i also of course set my HP to 20000 just so i dont die before being knocked down. also Drauger shout produce the same glitch as well. anything with knockdown works. 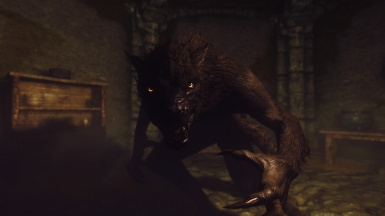 also sometimes upon being knocked down the werewolf does get up and does a howl as if doing the transformation howl, then the PC returns to normal movement controls. 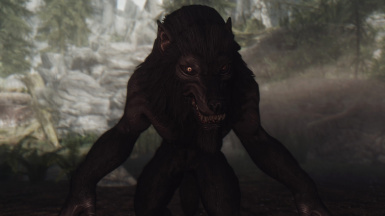 also if stuck in the getting up glitch sometime being knocked down 1 or more times in this state times will fix the werewolf stuck glitch and get up properly. iv been heavily testing this glitch myself, but unfortunately iv been unable to find the exact problem. 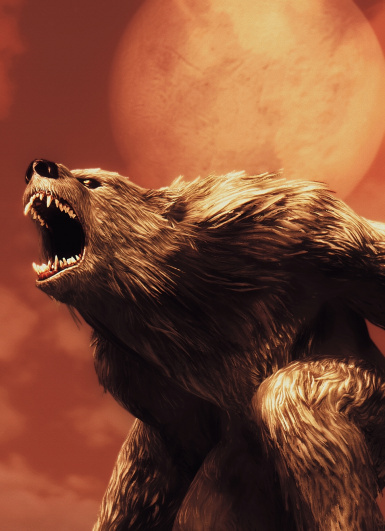 at this point i am looking for either a way to fix the knockdown glitch itself or perhaps a way to make werewolf completely immune to knockdown entirely. unfortunately it seems no mod exist for true knockdown resistance except threw enchantments. and i kinda don't want my normal human form just being immune to that. anyway ... any advice would be helpful. thanks! So how does the ring of Hircine work with this mod? I have it and I still can only transform once a day. What happened to the ring? Equip it. Check your powers for the "Ring of Hircine" power. Use that power. Done. Just like in vanilla Skyrim. is it possible to convert this to SE without any problems? I tried converting the animations and the nif files using the necessary tools however when I added it to my MO it keeps being flagged as "alternate game source". I enjoy this one better than the one that was made for SE so any help would be appreciated. The Mighty Beasts skeletons .nifs are not available for SE and they are not easily converted (i.e. via NifOptimizer). Unless I am proven wrong, this must be done manually. 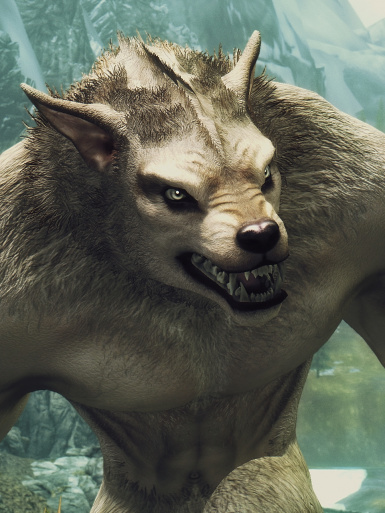 I'm running into an issue where going into my character's wolf form leads to them becoming this weird werewolf/human hybrid thing. Instead of moving and attacking like it should, it instead has me running around with human animations and attacking like you normally would while barehanded. 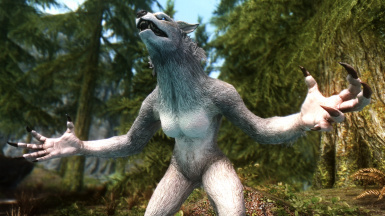 It even let me use spells and it acts like I'm in the proper wolf form since trying to access my characters menus leads to the game saying I can't access it. I have the animation stuff that was required and I've even tried starting a new character to see if it would continue doing it and it still did. Not really sure what the deal is. Edit: Turned out I still had the previous version of the mod and that was causing the issue. 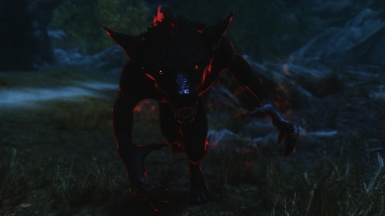 After uninstalling it, the werewolf form works like it should. But in looking at the required mods there's two new extras that need to be installed first ? Fores New Idles in Skyrim - FNIS and skyrim official patch :huh: , I dont remember that being a must =( ..
whats even in the patch that makes it needed ? just asking ..
Is there an Old file of this I can download that Doesn't need these 2 , all the old files I've looked at seem to have them as a requirement ?